As the greatest football show on earth commences today, RIR identifies key players on the Russian team. The Russian national team is a dark horse at the World Cup in Brazil. It does not have a single member who has played football abroad. Moreover, with the exception of the Head Coach Fabio Capello, the team has no stars. That does not prevent the Russians from seriously expecting to at least make it through their group. RIR has identified key players in the Russian team. Looking at the statistics of Igor Akinfeev, one might think that he was forty years old. More than 400 games for CSKA, almost 70 games for the national team, five Russian championships, the UEFA Cup and a whole list of national records. Several years ago, Manchester United was seriously interested in Akinfeev. Peter Schmeichel has recently confirmed that Sir Alex Ferguson saw him as a successor to Edwin van der Sar. However, the goalkeeper was injured, and he never moved. 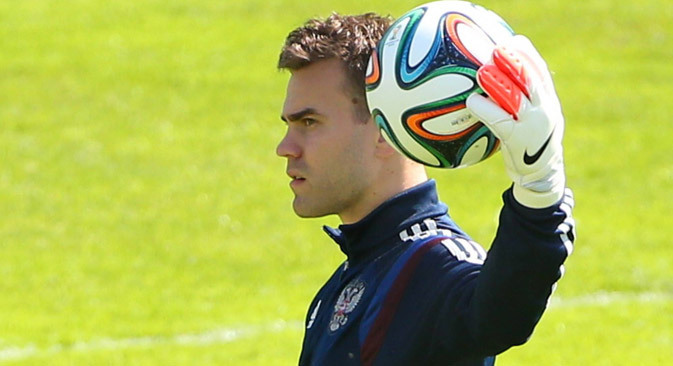 Akinfeev made his professional debut at age of 16, and by 17 had already became the main goalkeeper of CSKA and took that team to its first championships in many years. Since then, he has become a symbol of the strongest Russian clubs. Interestingly, even with all his regalia, Akinfeev only participated once in a major football tournament as the main goalkeeper. He was number one on the Russian team during the Euro 2008, in which Guus Hiddink’s team reached the semifinals. Four years later, Akinfeev, recovering from a serious injury, went to the Euro as a backup for Vyacheslav Malafeev, but in Poland, the Russian team was not able to move past its group. In Russia, since the Soviet times there has been a tradition – at the end of the season, the football federation makes a list of the 33 best players, three for each position. Since 2001, on the list of the best central defenders Sergei Ignashevich has invariably appeared at the number one spot. This is an absolute record. Ignashevich began playing for Torpedo Moscow, but turned into a top-class player with another capital city team – Lokomotiv, with whom he won his first title. If not the tallest player in this position, being 186 cms tall, Ignashevich has amazing talent and rightly chose his position. Moreover, Sergei he well with his head as well as in the opponent’s penalty area, into which he comes after the ball comes into play, and is also good at making penalty shots. During his career, he scored more than 50 goals. On the Russian national team, there is simply no replacement for this 34-year-old veteran, whose biggest shortcoming is his slow speed. There is no other footballer on the current Russian national team, who has received as much press coverage in Europe as Alan Dzagoev. He is regularly included in lists of the most talented young football players of the Old World, but he stays with CSKA. And this World Cup may become the defining moment in the career of this football player. At the age of 17, Dzagoev had already scored goals for his first team, CSKA Moscow and celebrated his first major victory – the 2008 Russian Cup. Even back then, Tottenham and Chelsea started showing interest in him. Nevertheless, he remained in the camp of the army, though not all the coaches placed him on their first teams. Dzagoev has all the qualities required of classic top ten football player – speed, dribbling, good kick, field vision and a scoring instinct. However, these are all leveled out due to one serious shortcoming – a short temper and inability to control his emotions in difficult situations. During his career, he has been removed five times from the field, and each time it ended with a scandal and a serious investigation. There is a suspicion that it is this temper of his, which prevents Dzagoev from becoming a main player on the Russian national team under Fabio Capello. The 23-year-old forward from Dynamo Moscow is one of the Russian players, who scouts from top European clubs will be watching very carefully in Brazil. By all indications, Alexander Kokorin should be able to grow into a big star. Kokorin holds a team record – on September 6, 2013, he scored against Luxembourg, just 21 seconds after the match started. And this goal remains the fastest ever scored in the history of the national team. Already at the age of 17, Kokorin became a member of the first team of the Dynamo. However, fame and the first big money had an impact on him, and not in the best direction – in 2010, he scored no goals. However, the following season he was named the best young player of the country. Then stability followed as well – in each of the last two seasons, Kokorin scored ten goals. Kokorin, who resembles a popular singer nicknamed the ‘Russian Justin Bieber,’ was in the Russian squad at the European Championships in 2012, and was even given some playtime.